As many as 11 students of DAV International School, Amritsar won prizes in different categories in the ‘Youth Flair’ organized on 22 November, 2018 at DAV University, Jalandhar. 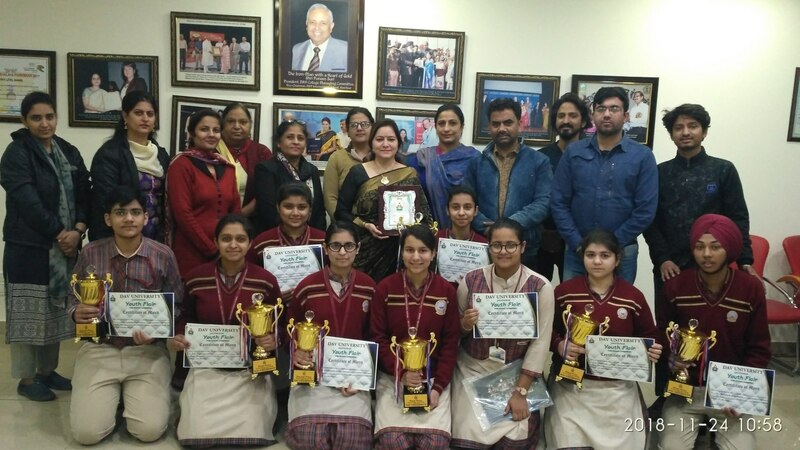 Hargun and Yashika (XII) won 1st prize in Flower Arrangement, Anmol and Kanika (XII) got 1st prize in Rangoli, Nandini and Bhavnoor (XII) outshined everyone in the English Debate, Prabhjot Singh (XII) secured 1st position in Solo singing, Richa Bhandhari (XII) received 1st prize in Town Planning, Samridhi Sharma (XII) got 2nd prize in Power Point Presentation, Madhusudan (XII) got 2nd position in Model Making and Advitya (XI) received 3rd prize in Poster Presentation. Principal of the school, Dr. Anjana Gupta appreciated the efforts of the winners wholeheartedly and applauded them. She acknowledged the hard work of the event incharges for the brilliant result and motivated them to continue their efforts in the same direction. She extended her best wishes to the winners for their future ventures. On this occasion, Regional Officer, Dr. (Mrs.) Neelam Kamra, Chairman, Dr. V P Lakhanpal and Manager, Dr. Rajesh Kumar congratulated the students for their achievements.